This accommodation has 4 bedrooms, that can accommodate up to 9 guests. There is a living/dining room area and a full kitchen. 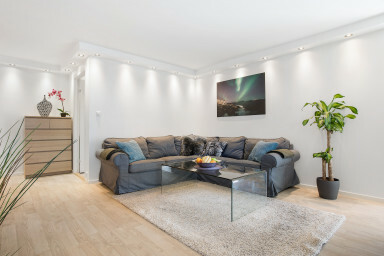 This newly renovated accommodation by Sonderland Apartments is located right in the city center, and only 10 minutes walking from Karl Johan Street, Oslo’s main pedestrian street with restaurants and shopping. Karl Johan Street leads to the National Theater, The Akershus Fortress and Aker Brygge, Oslo’s beautiful waterfront filled with life. This is the perfect starting point to visit Oslo’s best attractions! You can also walk to the Oslo Opera House and see amazing views of the Oslo Fjord from the roof, or visit the Munch Museum or the Botanic Gardens within 15 minutes walking. This apartment accommodates a large group in its 4 bedrooms, and a total of 9 single beds. There is a living/dining room area with a big flat screen TV, a sofa, a dining table and an enclosed balcony for fun meals and evenings together after a day of exploring. A crib for the little one is also available upon request. It has an open kitchen equipped with everything you need to make your own meals, including tableware, a coffee machine, stove and oven, fridge, microwave and dishwasher. The bathroom has a shower and is equipped with a hair dryer, an iron, a washing machine and a tumble dryer. There is free Wi-Fi, and linens and towels are included. We do not offer shampoo or food items, but there are markets and supermarkets right outside the main entrance. The building has an elevator, and a garden with picnic tables so you can eat under the sun in the warmer months. The Oslo Bus Terminal is a 6 minute walk away and there are 10 minutes to the main train station. The subway station is a couple of minutes away, and the tram and bus stops are a couple of blocks away, making it easy move around the city. There are cozy cafes and restaurants right outside the apartment building..